Alvin Lagumbay upsets the former world title challenger Keita Obara last April 12, 2018 at Korakuen Hall in Japan. The unknown Filipino traveled to Japan to face the hard hitting Japanese Keita Obara, the Filipino won the fight on rare double knockdown in the 2nd round, both fighters connected with their left hook at the same time, both down but the Filipino stood up early while the Japanese was badly hurt in the canvas. 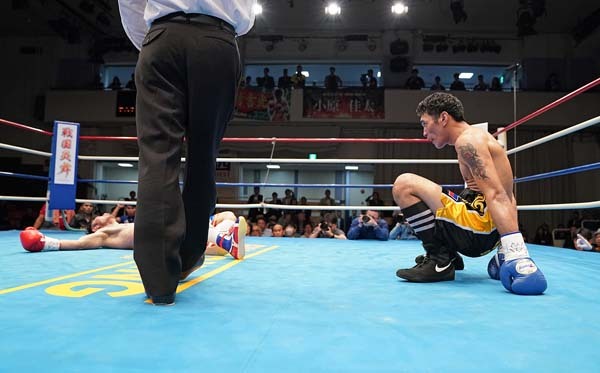 The Filipino Lagumbay improved his record to (10W-2L, 9KOs) while the former world title contender Keita Obara tasted his 3rd defeats and dropped his record to (19W-3L, 17KO's). This was a big upset for the Filipino considering the Japanese is one of the best fighter in the welterweight division. Lagumbay won the World Boxing Organisation Asia Pacific Welterweight Title. Meanwhile in the mainevent, Filipino Richard Pumicpic successfully defended his World Boxing Organisation Asia Pacific Featherweight Title against the formerly undefeated Japanese Yoshimitsu Kimura via unanimous decision.